You&apos;re looking at what may be the first Google Pixel 3 XL photo leak, and it has good news or bad news, depending your thoughts on iPhone X-like displays. There&apos;s clearly a notch cutout at the top of the display, according to a pair of photos posted to XDA Developers. For many people, the controversial notch is bad news. But the notch effect is good news if you want a bigger all-screen display from the Pixel 3 XL. The bezels around the Pixel 2 XL and Pixel 2 were certainly larger. Many Android phones (LG G7 ThinQ, OnePlus 6, and Asus Zenfone 5) are following the notch trend first seen in the Essential Phone (RIP) and popularized by iPhone X.
It&apos;s all in an effort to get an extra half-inch of screen space, but keep the top speaker and front-facing camera in place. There&apos;s enough space at the top for two front-facing cameras, as rumored last week, but we can&apos;t make out where the Pixel 3 XL puts its bottom front-facing speakers that we liked about last year&apos;s phone. Curiously, previous leaks for the normal-sized Pixel 3 show a phone with no notch whatsoever, and there may be a cheap Pixel 3 in the works with a similar look, too. This appears to be the first leaked photo of a Pixel 3 XL, however, we&apos;ve seen what may be the phone&apos;s front glass before, and it showed a very similar notch. It should be noted that today&apos;s forum post leak does state it&apos;s a prototype phone. Likewise, the specs splashed across the screen may be far from final. 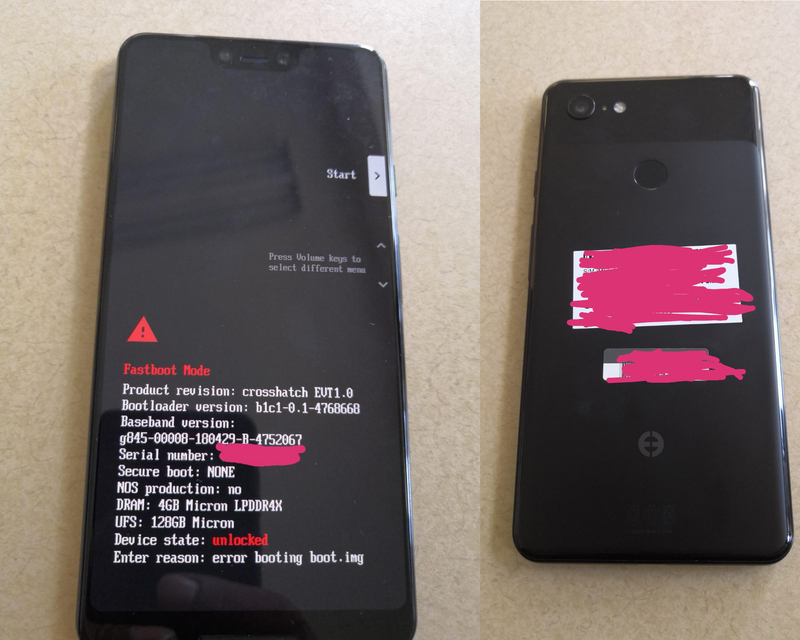 The alleged Google Pixel 3 XL prototype has just 4GB of RAM and 128GB of internal storage. The back shows a design and a single lens, both matching the Pixel 2 XL. Google is expected to launch the Pixel 3, Pixel 3 XL, and maybe a cheap Pixel 3 later this year, likely in October again. We&apos;re sure more notch-filled leaks will emerge between now and then.